I dragged Veken to the Bushwick Open Studios yesterday and under the hot Brooklyn sun we toured about a dozen industrial buildings filled with artist studios and lofts. It was a great way to get to know my newest neighbors and an intriguing way to see the buildings that are home to the thousands of artists, writers, musicians, hipsters and students that now call Bushwick home. The stars of our tour were two installations that were quite amazing, each in its own way. 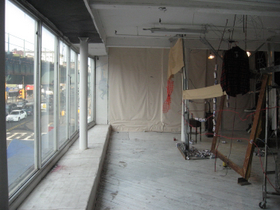 “30 Year Fixed” (2007) was a mixed media installation by Andrew Ohanesian & Tescia Seufferlein at their 117 Grattan Street studio (photos). From the hallway, all you saw was a perfectly framed living room, filled with the homey trappings of an established and stable life. Only a hole in the hallway wall gave any indication that the pristine setting was disrupted. 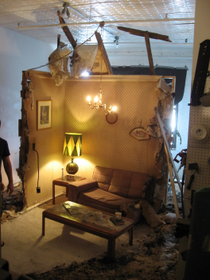 As you walked through, the picture postcard view of domestic life gave way to a shockingly demolished room. Removed from all support, the corner of the room is reconstructed amidst a hurricane of rubble, broken fans, wires, dirt and wooden armatures. The work is a commentary on the war, which was a once (for some people) a noble national endeavor that has quickly become a global nightmare. Even the couch in the reconstructed room is cut in half, as if by some godly hand, the level of destruction to this domestic setting is total and indiscriminate. “Fantasy of an East Williamsburg Loft as an Affordable Housing Unit…What is Affordability?” was the other notable installation by Group 238 (Nyx, Page Whitmore, Melissa Bolger) at Grace Exhibition Space (840 Broadway) on the southern boundary of Bushwick (photos). The installation is based on a floor plan for a one-bedroom low-income public housing unit in Bushwick. The structure is built out of graffiti-inspired dialog-based oil paintings documenting conversations with real-estate developers, new residents of Bushwick and long-term residents of Bushwick experiencing development-led displacement. It’s good to see that Bushwick is continuing to growing into a laboratory for the city’s art ideas. 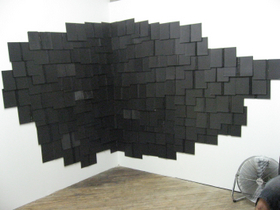 Other good artists I saw during our tour were Richard Martinez, whose wall pieces with black painted book spines were quite beautiful (images), and the ceramic wall pieces by Andrew Cornell Robinson were intriguing (image)(his website has many more images). I should also mention that the show at Adhoc Art was rather good (it included Josh MacPhee, Billy Mode, & Chris Stain) and there was one piece obviously based on Hurricane Katrina and alluding to the famous Emanuel Gottlieb Leutze painting “George Washington Crossing the Delaware” (1851) that I would’ve bought if it wasn’t already sold! Quite stunning, really. There was an art parade that we missed (it supposedly started at 11:30 am, and we got out of my loft at 12:30!) but you can see images from last year’s event here and I’m sure this year’s parade will eventually surface on the web. 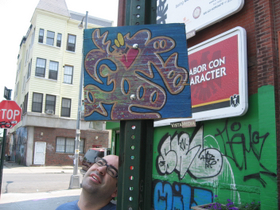 Check out an assortment of photos of some of what we saw (including a lot of street art). Here is a complete list of the artists that opened up their spaces. Thank you for including me in your blog post. I hope you get to come visit sometime, neighbor! thanks i was feeling bad for not being able to go, this makes up for it, well kind of..! Thanks Hrag! for taking all these pictures. My favorite is the onw with Veken looking up to a painting. As Neery said, it does make-up a little bit for not being there. But I still would have preffered to walk around and get your first hand reactions – hope you invite me again. Thanks for the kudos Hrag. It was nice to meet you and Veken at the studio. I also loved Andrew and Tescia’s installation. Very cool and kind of shocking. They’d been working on it furiously for some time now. really glad you liked it, drop by anytime, we thought you got some great pictures of the installation. Glad you like it Andrew. It was a very impressive installation with some great glimpses of things that offered some interesting insight.